Edmonton Overhead Crane Safety Training - Overhead crane safety training equips operators with knowledge and skills about crane safety measures, accident avoidance, materials handling, and equipment and stock protection. 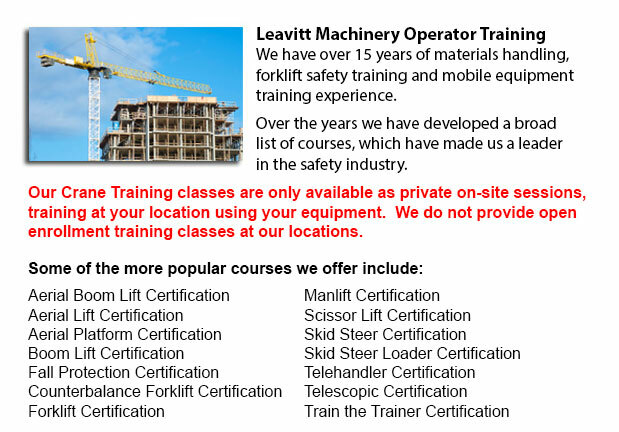 Trainees would learn the types of overhead cranes, their capabilities and their uses in various industry settings. For operators who are licensed and trained, the shift in liability moves from the company to the operator. Thus, the course emphasizes individual operator duties. Overhead crane safety training instructs operators in the correct methods for doing checks. Two kinds of pre-shift inspection are the walk-around inspection and the in-depth inspection. These are critical every day routines that must be logged. Correctly recorded pre-shift inspections help to protect the company from liability in case of an accident. Pre-shift inspections also prevent damage, costly repairs and accidents. Operators learn how to designate a particular person to handle checks, how to maintain the log book and how to report problems. Inspections should be carried out often and documented properly. The following should checked while watching for usual problems: hooks for cracks, increases in the throat opening, degree of twist; hoist ropes for corrosion, worn wires, loss of diameter, broken wires, kinks and bird caging, chains for nicks and gouges, chemical and heat damage, twists, cracks and corrosion, excessive wear, distortion, stretching, pits, damage from extreme heat. The operator will get to learn the right techniques about correct rigging procedures. The process of rigging includes the understanding of the manufacturer's data plate, determining the weight of materials to be lifted, choosing the gear, and utilizing safe practices to secure the load. The course include in detail the following: safe working loads, and the capacities of ropes, chains, slings, hooks and shackles. It is essential to know who can operate the cranes at your facility, physical requirements of the job, and operator credentials required for specialized job and permits. Safety is a priority when operating near pedestrian traffic. The responsibilities included in the safe crane utilization includes checking for hydraulic leaks, undertaking visual inspections, checking the safety guards, testing the controls, examining the hook and hoist rope, braking mechanisms and limit switches. Right reporting methods are important. These subject matters are all included in depth in the program. The program also includes the proper lifting and moving methods with cranes and hoists. Operators will likewise learn correct hand signals. Training involves how to attach the load, raise the load, set the load, unhook the slings and abort a lift. The steps included with moving the load, consists of: starting and stopping procedures, guiding and controlling the load, working with signals and observing working conditions. In the event of power failures, the operator would need to know how to proceed. The program includes techniques for removing the slings and lowering the load, storage of equipment, parking the crane, and securing an outdoor and indoor crane.